Neighborhood and Rural Preservation Companies provide a wide array of services across New York State, including but not limited to: housing rehabilitation, home buyer counseling, tenant counseling, landlord/tenant mediation, community rehabilitation and renewal, crime watch programs, employment programs and legal assistance. Some preservation companies also plan and develop capital projects, including new construction and/or rehabilitation of older housing stock. For the second straight year, the Executive Budget proposed cutting funding to the Neighborhood and Rural Preservation Programs by approximately fifty percent. 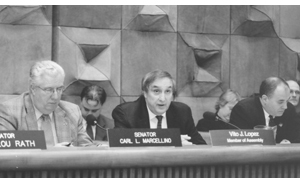 As a result of Committee Chair Vito Lopez’s successful negotiations with the Senate through the conference committee process, funding has been restored to these invaluable programs. As it has done in the past, the Committee has specified that this additional funding is unrestricted and companies may use it for operational expenses at their discretion. The successful efforts to restore $7,411,500 to the Neighborhood and Rural Preservation Programs should bring each of the 160 neighborhood preservation companies and the 70 rural preservation companies up to an annual contract award of $65,000 and provide an increased contract award for the respective coalitions. The joint Assembly and Senate conference committee agreed with the Governor’s proposal to add $2 million to the SLIHC. This funding will result in an additional $20 million being invested in affordable housing in New York State over the next ten years. The tax credit serves to assist low-income elderly and working households where home ownership is not a practical alternative and the rents of conventionally financed dwellings are not affordable. Ten million dollars has been added to the Affordable Housing Corporation, which administers the Affordable Homeownership Development Program. With the Executive’s original $25 million appropriation, the enacted budget appropriates $35 million to this successful program, which promotes homeownership for persons of low and moderate income by providing financial assistance for the construction, acquisition, rehabilitation and improvement of owner-occupied housing. 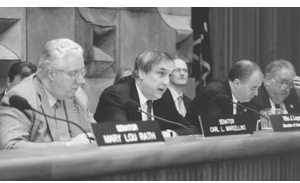 Housing Committee Chairman Vito Lopez co-chairs meetings of the conference committee that negotiated housing funding for the 2005-2006 state budget. The conference committee was also successful in adding $10 million to the Governor’s $29 million appropriation to the Housing Trust Fund Program. This extra money will allow the Housing Trust Fund to provide additional funding for the construction of low-income housing, rehabilitation of vacant or under-utilized residential property and to convert vacant nonresidential property to residential use. Negotiations with the Senate resulted in an increase of $1,000,000 to the Governor’s appropriation of $400,000 for the HOPE/RESTORE program. This money will provide additional financial assistance to administer the emergency home repairs program. It will also provide grants of up to $7,500 per unit for the cost of correcting any condition which poses a threat to the life, health or safety of a low-income, elderly homeowner. 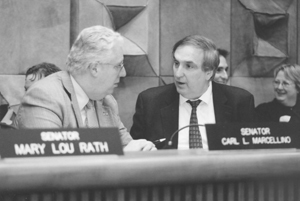 Committee Chair Vito Lopez fought for funding for the Urban Initiatives program, which has been absent from the budget for a number of years. The Senate agreed, and $1,500,000 was appropriated for this program. The money will provide grants of up to $50,000 to organizations in cities of 53,000 or more for the revitalization and improvement of housing and local commercial service facilities. The conference committee also agreed to appropriate $1,500,000 for the purpose of implementing a Senior Housing Demonstration program. This program will construct affordable multi-family rental housing for senior citizens of at least 62 years of age. Conference Committee negotiations also resulted in a $1 million appropriation for the Rural Area Revitalization Program. This program will fund projects in rural areas that will be likely to contribute in a significant way toward the revitalization and general community renewal of the region.